Let’s face it, shells are beautiful. The bigger the better. As a child, we used to collect shells on our weekly summer visits to the (New) Jersey Shore. Most of the time, we just used them to decorate sand castles we built and left them behind. Fast forward many years later to when I learned how to scuba dive. I did my open water in The Maldives. The Maldives are many atolls with a resort built on them. 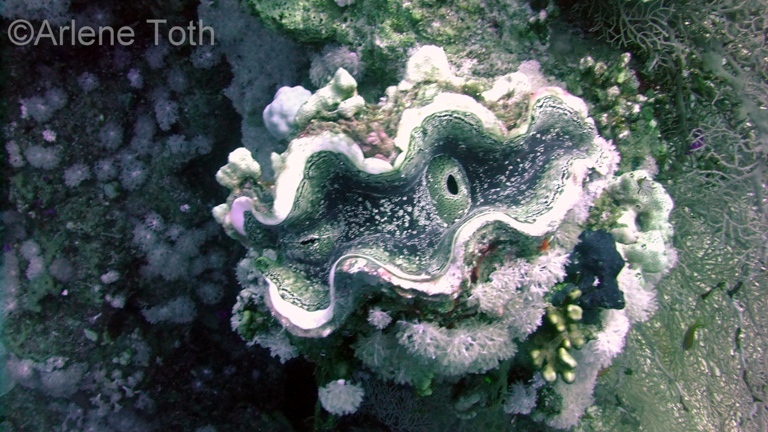 Most of the beaches on the atolls are made up of coral. It is against the law to take any shells or coral that is washed up on the beach or to take anything from the sea. I have tried to respect this law – it is really difficult when you see a beautiful piece of coral washed up onto the beach, but it isn’t worth the fine or the time in jail. Many islands in the Caribbean have beaches made up of coral. Just think about it. I currently live near the sea. You would think that it would be natural to go for the beachy look when decorating your home. Well, I live in the UK and the light isn’t always right for the light and airy beach look. It only looks good on sunny days and we don’t always get many of those even though I live on the ‘Sunshine Coast’. At this time of year, the blogosphere is rampant with ideas for decorating with shells. Google it yourself and see. 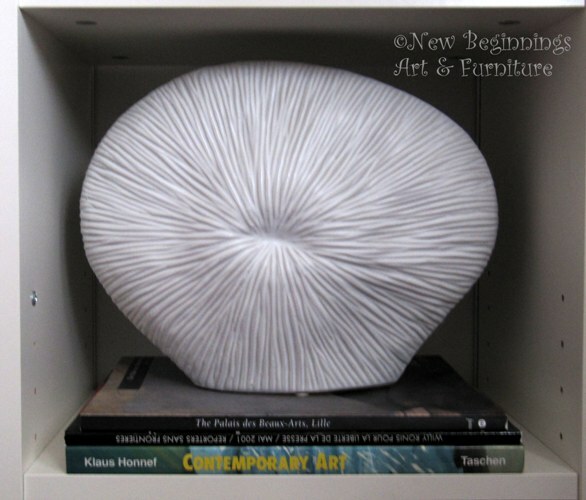 I am not posting any photos with shells used as accessories in decor as I do not want to encourage this trend. We do have a few shops that sell seashells, by the seashore. They are most likely imported. It isn’t something I want to encourage and so I don’t buy, even though they are beautiful. There is a price to be paid for decorating our homes with shells and I don’t want to be responsible for the outcome. By the way, I have not been immune to shell buying in the past. I have some shells. However, there is no point in throwing them out as the deed had been done. I don’t buy them anymore. There are a few companies that make faux or artificial shells. I would buy them if there were any in the UK, but they seem to be made in the good ole USA. Instead, I try to decorate my home with shell inspired items or paintings that depict the sea or seaside life. 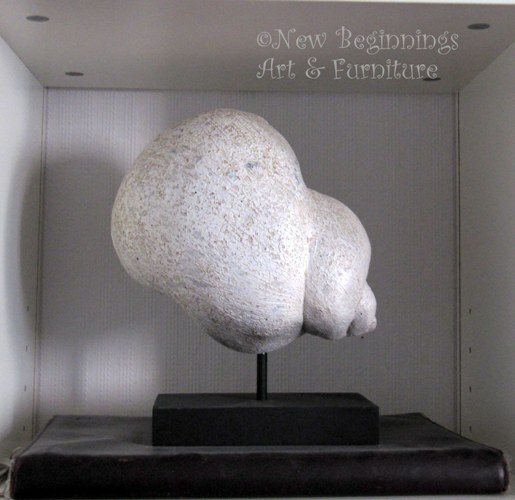 This is a wooden shell sculpture that I purchased at Home Sense. I love how it looks like a shell, but it obviously isn’t. 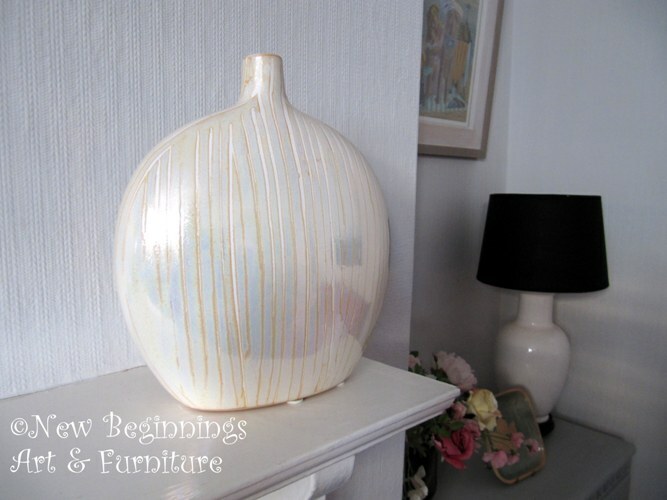 This vase reminds me of a sea urchin skeleton. This vase has colours like mother of pearl. This and the vase above were also purchased at Home Sense. You don’t have to limit yourself to vases, sculptures or painting to get the seaside effect. The colours of your home can give it that seaside feeling or you can put up photographs of shells. This is what those giant clams look like in the sea, where they belong. When they die, they stay where they are and the coral moves in to make a new home. You would have to dive down and take this off of the reef and kill it if you wanted to sell it. You would never find a clam shell such as this on the beach. Nowadays, when we decorate our home, I think it is just as important to think about the effect on our environment as well as the look we are trying to achieve. Might be time to start thinking out of the box to get the seaside look for your home. Creating art has taken a bit of a back seat lately. I have been painting a lot of furniture. I love painting furniture. It is creative and practical. I’m a practical lady. Besides, I have all of this furniture in my house that needs painting. The creative process has many forms. People, whether they realise it or not, are very creative. They just need to find out where the creativity lies and work out what they are good at. I am quite good at painting things for practical use. I am learning to develop my artistic side – to make something just because it looks good or interesting or beautiful. I find it challenging to make something from nothing, just from my head. Painting walls and furniture is easy for me. Working out what to stick on a piece of paper or canvas can test you to the limit. That is why I like to paint things. I like to paint things that I see like fruit and flowers. It is easy to get a hold of these things. Sometimes I paint things from photos that I have taken. Photography is another aspect of my art. I don’t just take holiday snaps. I don’t just document aspects of my life. I try to capture something seen from a different viewpoint. I take a picture to report. I take a photo of something because I think it is interesting or to use as an example as part of my writing. After many years of scuba diving, I have only just gotten into underwater photography. It is a challenge to take a picture of a creature without damaging the reef in the process. I am surprised at the many newly qualified divers who take pictures without getting their buoyancy under total control first. Since I started painting just over a year ago, I sometimes use my photos as inspiration to make paintings. 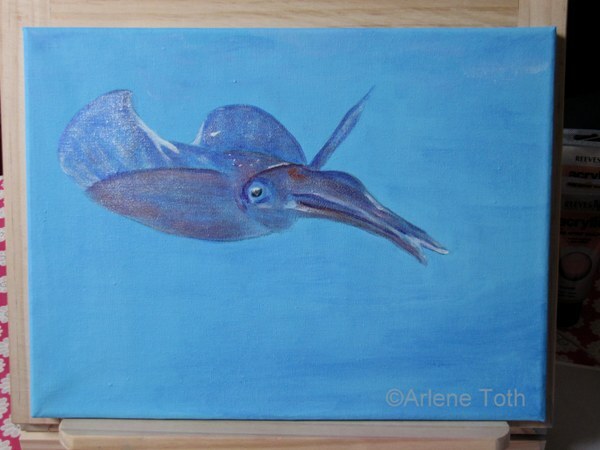 Since my diving holiday in August 2012, I have taken some underwater photos that I wanted to make paintings of. Not all of the photos are great, but they give me ideas, many ideas! This is an acrylic painting on A4 canvas. The canvas is one I had painted earlier in the year that I was going to use for something else. Obviously, waiting had its advantages. I am really happy with how it turned out and I had great fun painting it. I am now working on a series based on my diving photos. 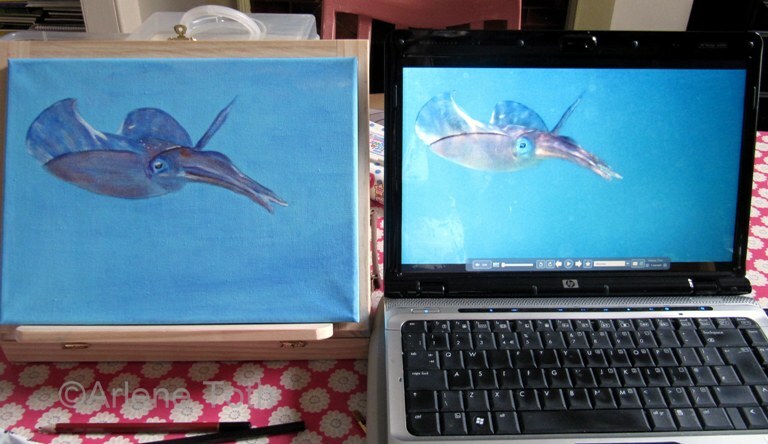 Just don’t expect your normal fish paintings.